Work to repair the submarine cable is scheduled for this week. SIX MONTHS AFTER Storm Ophelia ravaged Ireland, work will take place this week to finally restore phone and broadband services to an island off the Cork Coast. Sherkin Island, a five-kilometre long stretch of land of the southwest coast of Co Cork, is home to approximately 100 people. The island’s elderly population is particularly concerned about the panic button and panic alarm systems, which rely on a landline to work, independent West Cork TD Michael Collins said. Work to repair the submarine cable that brings power to the island is planned for this week, Eir told TheJournal.ie. Plans to repair the cable tomorrow were cancelled due to the weather conditions, as were plans to repair the cable in January. Both the submarine cable and the power lines on the island were damaged by the storm. Speaking to Patricia Messinger on C103’s Cork Today Show, Collins said that the situation was “unfair” for residents. Many residents raised the issue of the panic button to him when he visited the island, Collins said. “It means so much to them.” He said that residents are particularly reliant on landlines as there is often poor mobile phone reception on the island. Hitting the country in October 2016, Storm Ophelia was the worst storm to affect Ireland in 50 years. Three people were killed and more than 360,000 customers were left without power as 190-kilometre-per-hour winds crossed the country. Sherkin Island is close to the mainland, just ten minutes by ferry from the small fishing port of Baltimore, Co Cork. 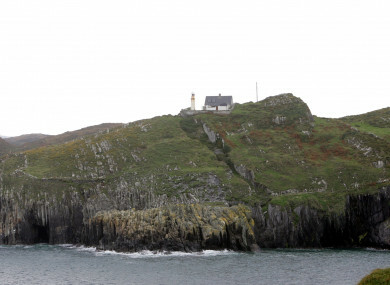 It is one of the seven inhabited islands on West Cork’s coastline, and hosts artists studios, a castle and a friary that dates to 1460. Email “Cork island left without phone and broadband for six months after Storm Ophelia”. Feedback on “Cork island left without phone and broadband for six months after Storm Ophelia”.